Ettore Sottsass, "Carlton" Bookcase/Room Divider, 1981. Milwaukee Art Museum, Centennial Gift of Gilbert and J. Dorothy Palay. Photo by John R. Glembin. Postmodern design is a difficult thing to pin down or describe concisely. It refers to all manner of playful, ornamented, subversive, and/or heady things. The aesthetic is often likened to 1980s popular objects like Swatch wristwatches, but the designer’s meaning often runs much deeper. 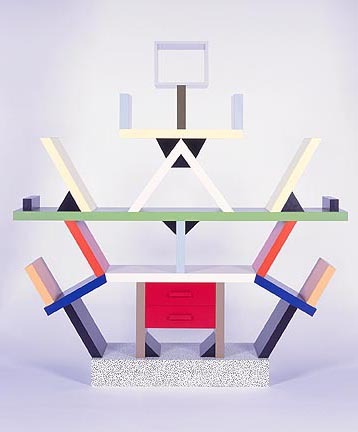 For instance, Ettore Sottsass’s Carlton bookcase (1981) doesn’t immediately convey its rich meaning. When we first see it standing boldly outside the 20th-century Design gallery at the Museum, we see that it is brightly colored. We think it seems impractical for book storage. We might find the stick figure silly. Why is this a design classic? Why is it so important that the Museum keeps it on view? Maybe because Carlton breaks a lot of rules? It is shockingly unconventional for a bookcase. Carlton is associated with the early 1980s Memphis Group, an association of designers led by Sottsass who flipped the idea of “good design” on its head. Most post-WWII design objects and design theory had been ruled by the idea that there was a right way to do things. A tasteful way. A rational way, determined by a few individual arbiters of taste. These mid-century designs were often beautiful and pleasing, but the effect was also quite sanitary, lacking historical references, multiple viewpoints, or wit. Emerging in the 1960s, and flowering by the 1980s, an alternative idea of a more pluralistic approach took hold. The Memphis designers consciously offered this type of alternative design, and they didn’t care if it was “good” at all. Sottsass’s bookcase is about ideas. It is paradoxical. Sottsass uses cheap industrial materials (plastic laminate), combined with vivid color (red, green), and ornament (the speckled base) to create an object that is about both the banality and the excitement of the mass popular culture environment of the shopping mall and the Las Vegas strip. On one hand, Carlton is tacky. On the other hand, it is cheerful. On one hand, it is cheaply made. On the other, is was an expensive luxury object purchased only by design collectors. Another layer of thought to this object, discussed by Glenn Adamson (Victoria & Albert Museum, London) in his recent lecture at the Milwaukee Art Museum, is that this type of design object is about presentation in a photograph. Sottsass knew that Carleton and other wacky postmodern objects wouldn’t be mass produced, but he did know that they’d catch attention and spread in photographs. Perhaps the very meaning of the object, the very design of the object, is to captivate in an image and spread the designer’s idea around the design world. It is an object that exists primarily for a photograph. For a little more information on Ettore Sottsass, you can visit the Ettore Sottsass exhibition website at the Los Angeles County Museum of Art website. Also, you might find it interesting that The Metropolitan Museum of Art includes Carleton on their “Timeline of Art History”. This entry was posted in Art, Curatorial and tagged 20th century art, Decorative Arts, Design, Ettore Sottsass, From the Collection, Furniture, Postmodernism. Bookmark the permalink. Woah! I’m really loving the template/theme of this site. It’s simple, yet effective. A lot of times it’s very hard to get that “perfect balance” between user friendliness and visual appearance. I must say you’ve done a fantastic job with this. In addition, the blog loads extremely quick for me on Firefox. Outstanding Blog! just tell me and I’ll remove it. Regardless keep up the good work.